A part of the document was ripped off and didn't survive. 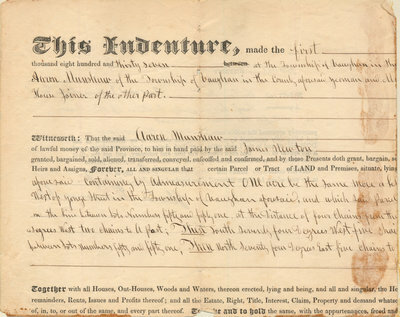 This Indenture made the first thousand eight hundred and thirty seven at the Township of Vaughan in the Aaron Munshaw of the Township of Vaughan in the County aforesaid yeoman and M[...] House Joiner of the other part. Before us Hector M. [?] Esq. and James Miles, Esq. and being duly examined by us touching her consent to be barred of her Dower, of and in the Lands within described, she gave her consent thereto, and it did appear to us that such consent was free and voluntary, and not the effect of coercion, on the part of her husband or any other person. GIVEN under our hands this sixth day of May in the year of our Lord one thousand eight hundred and thirty seven.